Senators yesterday afternoon confirmed Brett Kavanaugh to the Supreme Court (see my views on Kavanaugh here and here) by a razor-thin margin of 50-48-1 (Sen. Murkowski announcing “present” rather than “nay” out of courtesy for the unavailable countervote of Montana Senator Steve Daines, attending his daughter’s wedding). As a Fairfax criminal lawyer and individual, I was not surprised by the result after the previous evening’s news that Maine Senator Susan Collins (R) and West Virginia Senator Joe Manchin (D) had announced that they would vote for Kavanaugh. By the same token, I was not feeling particularly good about news of Kavanaugh’s conversation. Fortunately, when I learned of the confirmation, my wife, son and I were at a café only four blocks from the Supreme Court, after getting a look at the Viking ship docked for a few days at the D.C. Wharf. 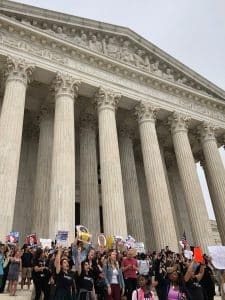 We all took a walk to the high court and witnessed the protest against Kavanaugh. Granted, the tenor of the protest was different than my own view. For instance, a large percentage of protestors spoke in terms of accepting that the sexual assault allegations against Kavanaugh are true, whereas I do not think I have enough information to agree. Nonetheless, I felt reinvigorated at this protest, with its positive messages to vote accordingly in this November’s elections, and of course it remains necessary to maintain vigilance over Donald Trump’s upcoming nominations to the lower federal courts, and to encourage our senators on their votes on judicial nominations and other matters that will be considered in Congress. To see some of the photos I took at the Supreme Court protest, check out my Instagram page (Instgram.com/jonkatz5). Fairfax criminal lawyer Jonathan L. Katz primarily practices criminal defense in the trial courts, while keeping abreast of developments in the appellate courts. To discuss your case with Jon Katz, please call his staff at 703-383-1100 to schedule a confidential consultation to map out a favorable defense strategy for your case.